Wandering in Paris: Luminaries and Love in the City of Light, has been awarded first place in its category (anthologies) at the London Book Festival! The awards ceremony was January 23, 2014 at the British Library in London. This is a 190-page anthology of short stories by 13 authors who shared a week in Paris together. The authors pre-sold copies so they would know approximately how many books to print in the first run. The book includes 30 black & white photos, a map, and a glossary. The Book Alchemist designed the cover and interior pages, and prepared the file for the printer, who did a short run of 250 books. The first printing has sold out; reprints available soon. 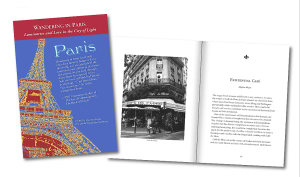 Paris reveals itself in fascinating and unexpected ways in Wandering in Paris: Luminaries and Love in the City of Light, a collection of sometimes funny, sometimes mysterious, always entrancing tales about the popular city. —Phil Cousineau, author of The Art of Pilgrimage and The Book of Roads.